It’s no secret; our rapid adoption of mobile devices is completely changing how we learn, search and buy. The traditional consumer journey models are undergoing a massive transformation. With consumer patience plummeting and expectations soaring, businesses that want to survive must adapt to these changes in order to stay in the game. 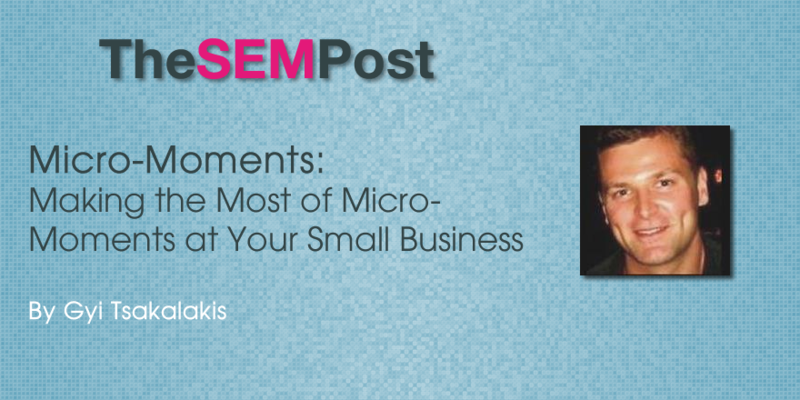 Here are a few priorities for small businesses to capitalize on in a world of micro-moments. It’s fairly clear that the catalyst for the micro-moment age is mobile. Instead of having to stop what we’re doing, we can act to supply our demand in the moment. 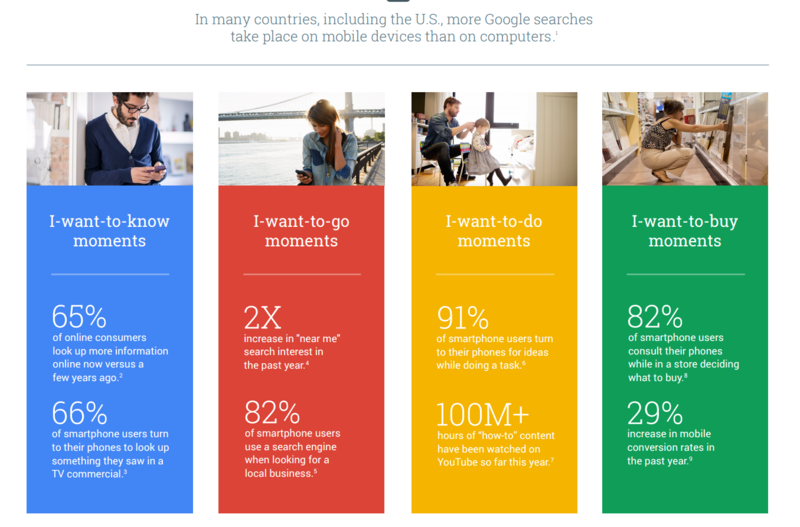 “Micro-moments are the new “I want to know”, “I want to go”, “I want to buy” moments. When people have a need, they reach for the nearest device for information. Consumers are open to having their preferences shaped by information presented at that decision time. It all starts with how people experience your business on their mobile devices. For most businesses, this means making your website mobile-friendly and freaky fast. But mobile experience in the micro-moment world requires more than merely having a fast, mobile-friendly website. It requires an understanding and acceptance that consumers’ expectations and behavior on mobile devices are different. If priority #1 in the age of micro-moments is a fast, mobile-friendly website, priority #1.5 is signing-up for Google My Business. In fact, if you haven’t signed-up with Google My Business, stop reading this post and go do it now. This is not the place to push the SEO envelope. Also, don’t be an absentee Google My Business landlord. Make it part of your daily routine to post news, offers and other updates about your business that both your current customers and your next customers are likely to expect. Be diligent about using photos and videos here too. Whether they want to know, want to go, want to do or want to buy, the mobile micro-moment consumer is likely to use Google at some point. 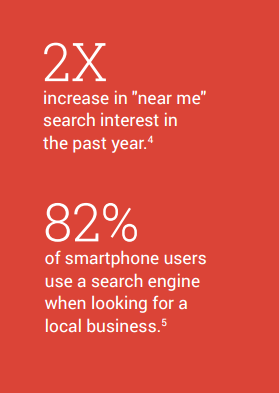 And for these searches, Google is particularly likely to deliver Google My Business listings. In the age of micro-moments, taking care of customers matters more than ever. But more and more, creating excellent customer experiences is just table stakes. You have to nudge your happiest, most loyal customers toward singing your praises online. You can be sure that you won’t have to nudge the customers you fail. Google My Business (get 5 here to start, work toward 30+). Your Website (Markup those review pages with Aggregate Rating schema). Facebook (yep, Facebook allows reviews and Google is showing review snippets). Yelp (yes, their filter is a pain, but they’re just so visible). Beyond these, search for your business and relevant keywords to see whether any vertical specific review sites have prominence in search engines. 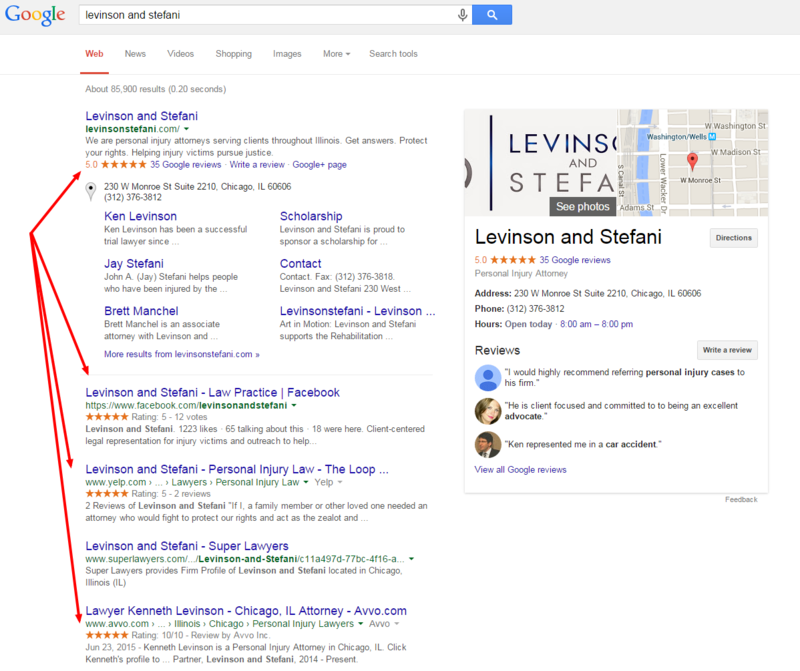 For example, if you’re a lawyer, there’s a pretty good chance that searches for your name will show Avvo listings. Furthermore, Google AdWords Location Extensions is now showing review snippets based on reviews on your Google My Business page. Micro-moment consumers want-to-know what other people think about you and want-to-buy from businesses that are making their customers / clients happy. I challenge you to show me an online channel that is not impacted by consumer sentiment. Finally, in order to compel consumers during micro-moments, small businesses must adapt their content strategy to account for different expectations. Among the most obvious of these relates to I-want-to-go moments. Google has reported a 2X increase in “near me” search interest in the past year (Google Trends, U.S., March 2015 vs. March 2014). Proximity matters to micro-moment consumers. Therefore, delivering content that speaks to location is critical. If you have a local brick and mortar business, be sure to add the appropriate local business schema. If you’re built on WordPress, consider Yoast’s Local SEO plugin. But adapting your content strategy to account for micro-moment consumer behavior is more than merely technical optimizations. It requires evolving your strategy to consider all the places you can meet your target audience. This will often require content development in places other than your website. For some content marketers, this feels uncomfortable. After all, you have much less control of consumer experiences on other sites. But that’s exactly the point. The micro-moment consumer doesn’t fit into a predictable funnel. Micro-moments tend to be reflexive, impulsive and fragmented. Which means businesses have to be where they happen, when they happen, delivering an immediate response. Listen to what customers and others are telling you about how and where they learn about the products or services you offer. Consider ways to respond in ways that makes life easier for them. Remember that location and proximity may be of greater significance to these consumers. Take an integrated approach. Remember that these micro-moments will occur across channels. How have you adjusted your small business’s marketing to adapt to the expectations of consumers in micro-moments? Gyi Tsakalakis founded AttorneySync and EPL Digital to help lawyers and businesses earn valuable attention online because that's where clients and customers are looking. He's a contributor to Moz's Local Search Ranking Factors survey and regularly speaks and writes about "searchy" things. In his free time, he nurtures an unhealthy relationship with football, especially when it comes to Michigan Football. If you find yourself in the Chicago area, and you like coffee, perhaps you can meet him face to face.